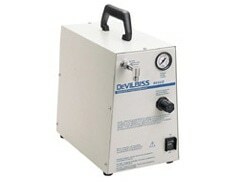 The DeVilbiss 8650D Heavy Duty Aerosol Compressor for continuous use is the ideal solution for extended care. The quiet, compact design, easy operation, and durability make this unit an ideal choice for continuous delivery of airway humidity and specialized drug delivery. This compressor is one of the quietest continuous aerosol compressors on the market. The unique internal mounting bracket design makes set-up and transport easier.